The usual search engines would give silly recommendations like “turn off your anti-virus”. 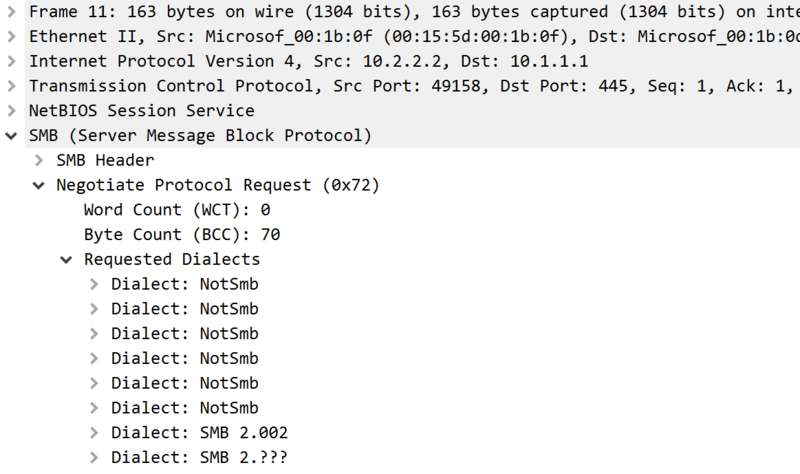 Using Wireshark and knowing a bit about the SMB protocol would quickly deliver a much more reasonable solution. The Negotiate Protocol phase is used to identify the highest common SMB version shared by client and server. The Session Setup phase is used to authenticate the client. The trace shows an NTLM authentication, which takes 4 packets. In packet 39 the server presents a challenge which the client uses in packet 40 to formulate a response. The Tree Connect would specify the share name. 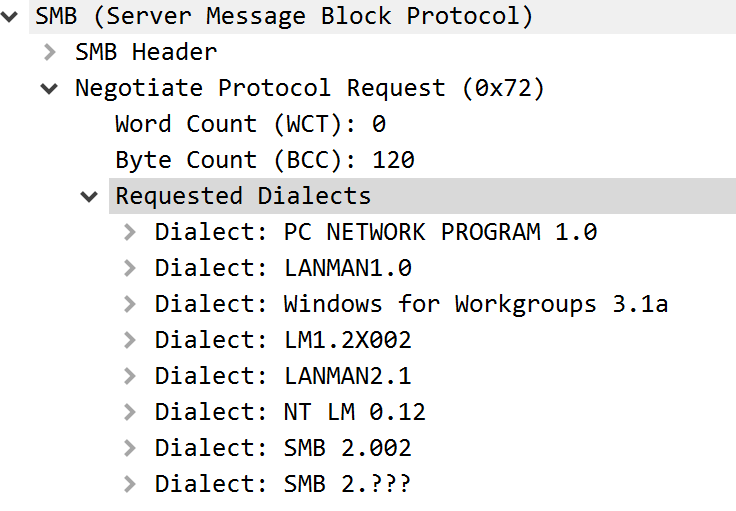 A trace file taken from the failing connection shows that client and server will not get beyond the Negotiate Protocol phase. The client aborts the TCP connection with a RESET. Clearly, the server did not like the SMB dialects offered by the client. The operation fails because client and server don’t support a common SMB dialect. Please note that the configuration for the MrxSmb10 driver and the LanmanWorkstation service can be found under the registry key HKLM\SYSTEM\CurrentControlSet\Services. Clearly, the workstation administrator was paying attention to Microsoft’s recommendation and had turned off SMB v1. Unfortunately, the server would only support SMB v1, which causes the connection to fail. On first impulse one might condemn the workstation administrator for disabling a widely deployed protocol. Watch the wording: “Widely deployed”. Hopefully not widely used: SMB v1 is only required to communicate with Windows XP / Server 2003 and older systems. Or Samba v3 and older, if you use Linux. These are legacy systems and should be migrated to a newer OS or turned off as soon as possible. SMBv1 is a security risk and should be disabled everywhere. In this case the server was running a more recent version of Samba. Instead of going back SMB v1 we tweaked the server to enable SMB v2. Case closed. Thought about caching issue, waited more than 30 minutes, still no “Negotiate Protocol”. Haven’t tried to reboot client though. Any idea of caching issue of “Negotiate Protocol” phase? Interesting situation. It is possible that the client still has open SMB connections or at least a file handle. I assume that you checked TCP and SMB Sessions? We’ve had very similar issue on one of our site. 20 IP cameras ” suddenly stopped recording” a video archive onto SMB server displaying meaningless error like “mount failed with unknown error…” or like that. Analysing a capture we’ve found the customer at one moment just limited SMB dialect on a server to the minimal version of 2.0 whereas IP camera’s firmware were not able to use it. So the customer needed to turn SMB 1.0 on again.